This is a simple script that uses the Frequency Separation technique from Photoshop, in order to split the image to Texture and Lighting passes so you can control each one separately. 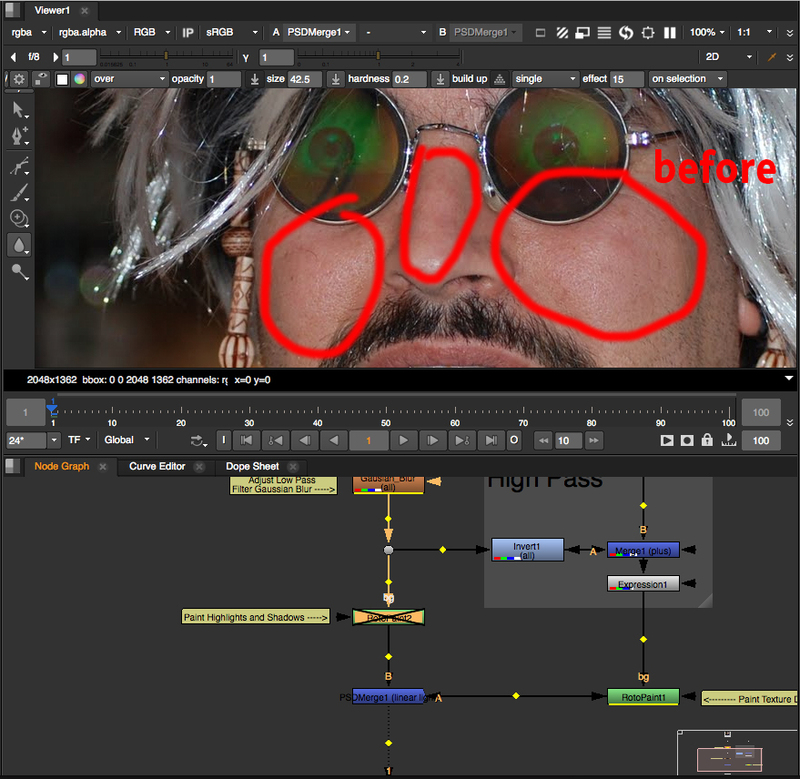 You can use the paint node in either the Low frequency image, to do lighting corrections, or paint the High frequency channel to fix Texture details. 1. Adjust the Gaussian Blur (1) until you dont see the texture detail that you want to correct. 3. You can use any other node after the RotoPaint2(2) and the final Merge(4), to blur sections of the image, like Blurs with mask regions tracked to the object, etc. 4. Use the RotoPaint1(3) with the Clone Brush to correct texture details, like blemishes and spotches. 5. You can also use tracked surfaces to help with the clone process after the RotoPaint1(3). nice one mate :) didn't even know this technic exist. do you know what the maths is for the psd merge operation ? sounds extremely useful! Could we get some screen shots? Thank you very much, i was looking for it since a while! Nice I was looking for that! It works great, except that it create some bad stuff in the highlights areas. We found out that if you change the color space to sRGB before your tool and switching back to linear after it remove that bug. I'm wondering if there is anyway we can change de psd merge by some regular merges...? That way we can stay linear all the way! And nuke loves Linear! expr0 "Ar > .5 ? Br + (2*(Ar-.5)) : Br + 2*Ar -1"
expr1 "Ag > .5 ? Bg + (2*(Ag-.5)) : Bg + 2*Ag -1"
expr2 "Ab > .5 ? 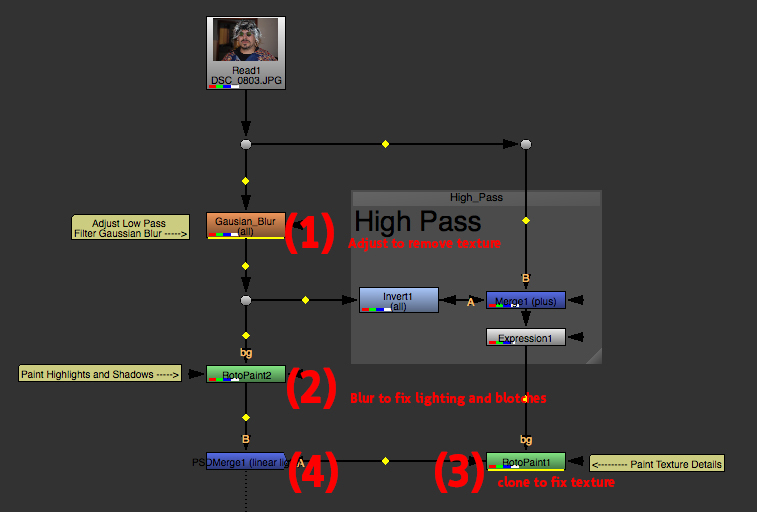 Bb + (2*(Ab-.5)) : Bb + 2*Ab -1"
label "Equivalent of a Linear Light\nblending mode in Photoshop"
Great work Simon! Thanks for posting this! regarding "Please remember to always have an Alpha channel in you image, or else the PSD Merge node will not function" - where does this required alpha come from ? 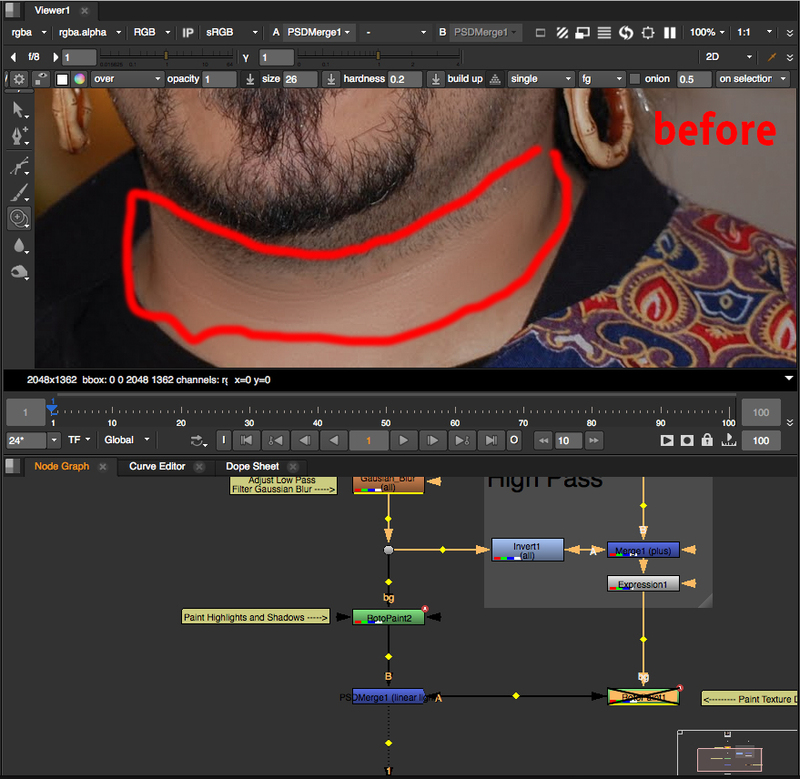 Follow up question: any advice on how to pull really good skin tone keys in Nuke avoiding eyes, hair, bg etc ? Was thinking I might build something like this myself, did a quick search and found yours.